I'm fairly certain it's common knowledge that I'm a glorified breakfast and brunch freak. I can happily devour a plate of the morning-time meal day and night. Quite frankly, I'm obsessed. But as a devout egg and bacon worshiper, you'll rarely catch me nibbling on a sugary pastry or a Belgium waffle. While those sweets definitely deserve some attention for their delicious nature, when it comes to breakfast fare, I am all about the savory goods. Hand me a fully loaded breakfast sandwich on a buttery croissant and I might just befriend you for a year. Present me with a lump crab cake benedict drenched in hollandaise and I'll likely love you for life. Yes, it's true. Breakfast is the key to this little lady's heart. So it's a good thing my fiance knows a thing or two around the kitchen when eggs, meat, and potatoes are involved. Yeah, I said "fiance." I suppose I should mention...we got engaged a little over a month ago. The guy took me on a surprise trip to New York City and proposed in Central Park. Yeah, he's been the man of the hour for for a while now. Okay, back to breakfast. That's why you're here after all! So with our severe addiction to runny yolks, crispy hash browns, toasty breads, and of course, smoked meats, we are constantly coming up with new creations to satisfy our cravings. Sometimes, I get breakfast recipe inspiration from amazing dishes I've feasted on at restaurants. You may remember that back in September, Chris and I traveled to California on a West coast road trip. Well, while we were there, we dined at one excellent eatery in Santa Monica called Huckleberry Cafe. Using only locally sourced ingredients, the quaint, yet extremely busy restaurant serves up some killer bites. And while the menu was swooning me in every direction, I opted for their famous Green Eggs and Ham. 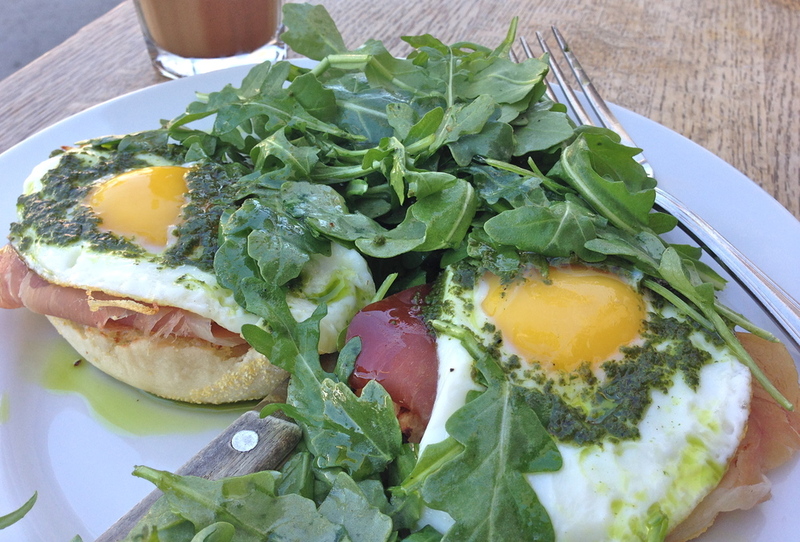 Two sunny-side up eggs, prosciutto, arugula, and pesto came piled high on a toasted English muffin. Rustic in presentation, it was one of the prettiest plates I've ever seen with the various colors and textures. And it tasted even better than it looked. 1) Prepare the pesto and set aside. If the pesto has been refrigerated, take it out for 30 minutes before you begin cooking to take the chill off. 2) Brush some olive oil on the English muffin halves and sprinkle with salt. Pop in the toaster. Toasters vary, but I usually wait until my eggs are just about done to "pull the toaster trigger." 3) Bring a large non-stick pan with olive oil or non-stick cooking spray to medium-high heat. Crack your eggs into the pan and let them fry sunny-side up until all of the egg white is completely cooked. Feel free to throw a lid on top like I did. If your pan isn't big enough for all 4 eggs, just cook two at a time. Sprinkle salt and pepper on the eggs. 4) In another pan, bring 2 teaspoons olive oil to medium-high heat. Then, quickly warm up the prosciutto in the pan (I heated it up for only 25 seconds). 5) Assemble your Green Eggs and Ham. Stack the English muffins with about 1/4 cup arugula on each half. Then, place one slice prosciutto and one fried egg on each muffin half. Top with pesto. Enjoy!! !